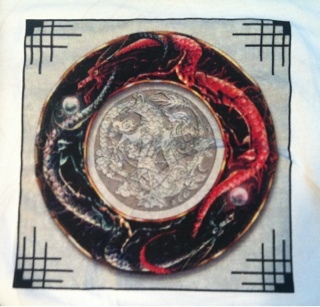 Dragon Knot 2 is finally finished!! Pattern purchased in February 2008. Finished July 29, 2012. 1 over 1 on 25 count lugana fabric. Finished size 12 x 12. 50 different colors. 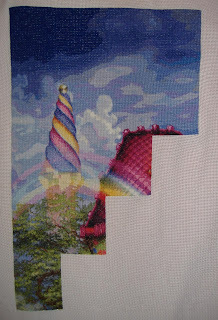 This week I've cheated a little in favor of Gaudí, so there's not much progress to show with the Unicorn. So I finally finished page 9. Took a little longer due to a cross country move. 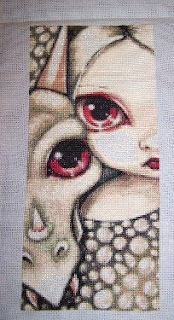 But it's done now and I no longer have to stitch this in secret! Hope you like. Stitched on 25 count Evenweave, 1 over 1. Even though I'm virtually melting in this heatwave the UK's going through at the moment I finally managed to get my page done on Izzy. 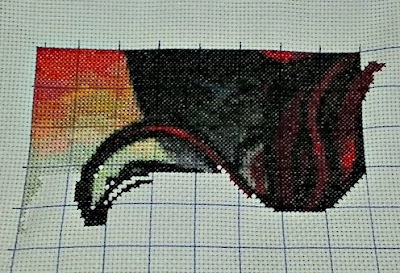 I must say that I thought it would never be done as I had several days of not doing a stitch at all but YAAAYY I did it! She's looking sooooo good although I was a bit worried about the orange stripes and spots on the edge of her dress but from a distance it looks perfectly fine and overall she just looks simply beautiful! So now I'm going to go down a page and work back across the bottom so I'll have done a 9 page square. Here is a picture for the blog, but if it doesn't work, ok. I have started in february 2012. Fabric: aida 18, marbled. My alias on the internet is Linotte*. Hi , my name is Grit, and I'm from Germany. "Cries of The Night" is my first Heaven and Earth Design. I finished page 3 from 36. I'm sorry it has been so long since I posted, but hopefully the pic will make up for it. This is my progress on one of the newly released Spangler SKs. This is Effects of Caffeine. 28ct, 1 over 1. Just giving an update on the Milk and Cookies stocking that I am working on. Have completed pages 7, 8, 9. My children can't believe how realistic it looks. I cant wait to get pages 4 and 5 done. Been working hard to finish QS Wizard of Oz in time for a birthday last week. I finished it with a day to spare. QS Wizard of Oz (Gustafson) Stitched 1 over 1 on 25ct Lugana. 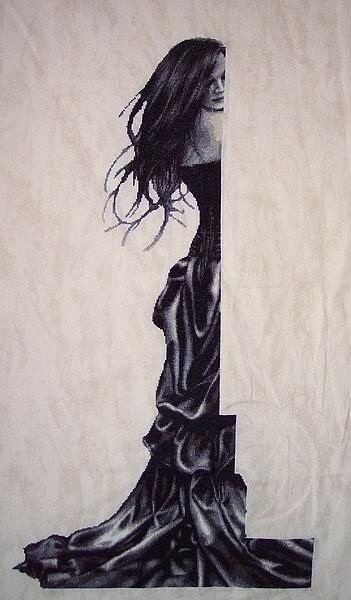 The piece measures approx 4 x 4 inches. I completed page 8 of Avarice too. 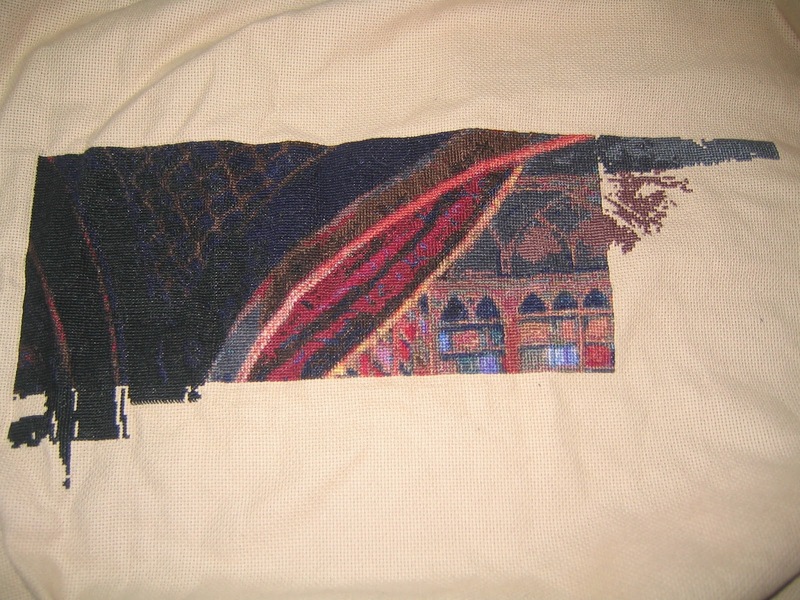 Was a faster page as it was mainly block stitching. Some confetti comes back for page 9 but its ok. 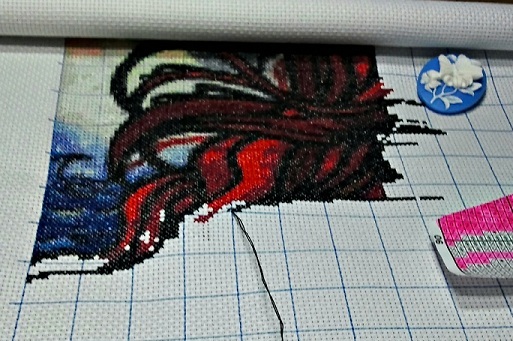 The rain we are having in the UK at the moment means more stitchy time! I love this Hanna is simple to do, if it has changes that have haed but not least! and is .... beautiful! And so on this great design! Hello. I'm Elfie (Lynne F in Australia). I haven't posted here since July 2010, when I was working on page 8 of Jolly Old Fellow. I have now (at last!) finished Jolly Old Fellow, so I wanted to put in a pic, in case any of you remember my project. I started JOF in January 2009, and worked on him for some months each year for a total of 13 months over the 4 years. This year I finished pages 14 to 36. 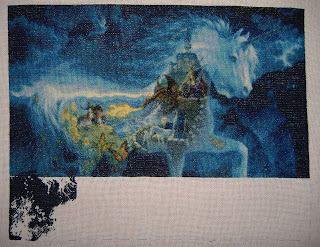 I am so pleased to have finally put in those final stitches, and now I am keen to have him framed. JOF was my first HAED, and it has certainly been a steep learning curve for me over the past 4 years. This project has taught me lots of things about myself – many of which I would have preferred to remain ignorant about! I do love the finished Santa – especially when viewed from a distance, when he seems to be three dimensional. 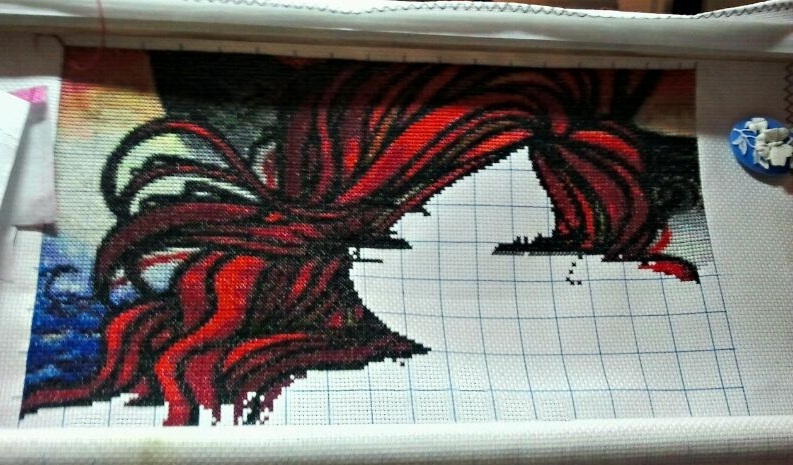 Here's my latest progress...a decent amount to show this time. I'm showing two pics because my camera reacted to Miss Pollyrose's white fur by lightening the picture. So the pic without her shows the progress and the pic with her shows a very accurate representation of the fabric and floss colors. Thanks, Polly! The project is one thread over one. Full cross on 25 ct lugana. Hi All, Here are my two for another month. 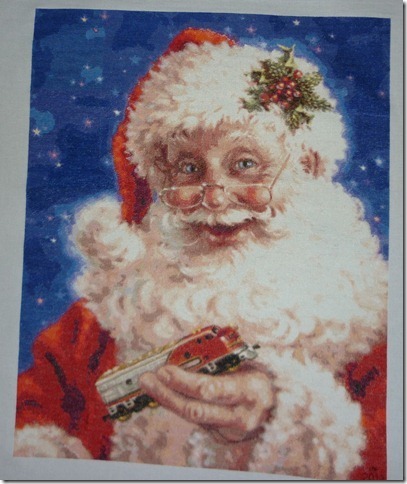 It was a long time since he took this magnificent santa, and I do not know why I stir with. But the other day when I saw it I felt like stick with it. I love this design! the truth is that I have wanted to see her face, although I still lack a bit. 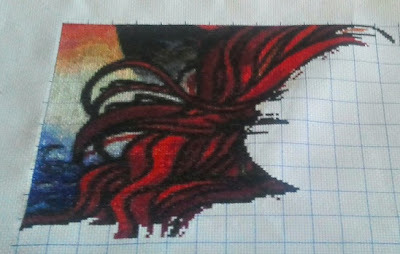 Here is my update on TT Purple Dragon.She is stitched on 18 count aida 2 over 1 full cross stitch. 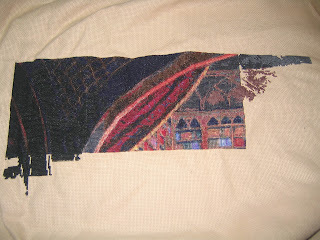 Both are being stitched on 18 count aida 2 over 1 full cross stitch and both are JBG charts.